Do you ever have those times that you just simply feel overwhelmed by life? That has been me lately. Life at my house has just been busy. Getting into the swing of our new routine with our daughter in school, me finishing up my last two terms of college, my baking has kept me super busy...plus our jobs. Yikes. Crazy busy. So, needless to say - I haven't had time to blog much lately. I think about it every day and then something else comes up and before I know it, I am exhausted and ready for bed. So I go to bed, that way I have energy to get through the next day. The only good thing about not blogging lately is that I have a notebook full of things to blog about. That's good, right? But, I did get some extra baking in for funsies this week. I have lots of zucchini and wanted to try something a bit different. 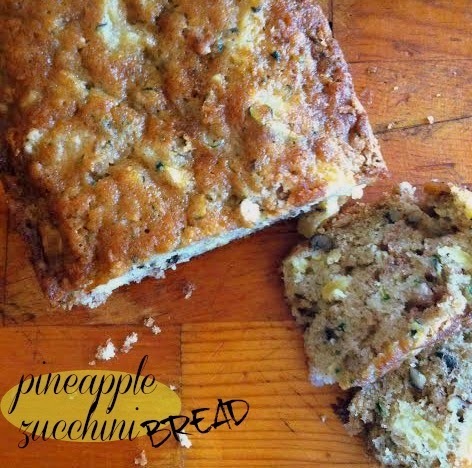 Out came the trusty recipe box and I found an interesting one...this gem for Pineapple Zucchini Bread. At first, I was like...oh heck no. That cannot be tasty. Then, I kept thinking about it as I browsed through the other recipes. Before I knew it, I was shredding zucchini as I was reading over the recipe card. 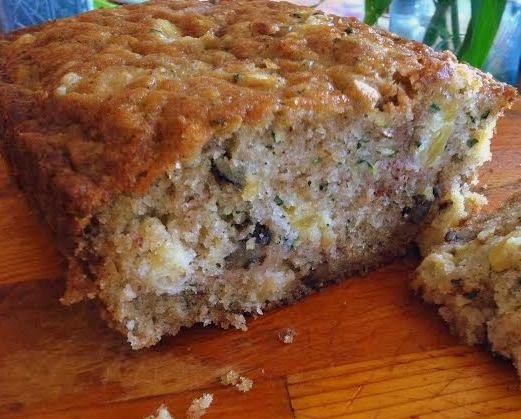 In a large mixing bowl, combine the grated zucchini, flour, salt, baking soda, cinnamon and baking powder. Stir in the oil and sugar until a wet batter forms. Fold in the walnuts and crushed pineapple. Bake for 60 minutes, or until browned and toothpick inserted in center comes out clean. Cool in pan for 15 minutes before letting cool on wire rack. Slice and serve when cooled.